Size 60" 63" 66" 69" 72" 75" 78" 81"
WOW, a 3-In-1 Blanket for Cool, Warm or Wet days!! For ages people have been “thatching”, which is to put a layer of straw in-between the horse and blanket, to provide the same results. Now you can thatch without the mess or extra task of having to clean your horse after “thatching” to prevent skin irritations. • Your horse can effectively regulate its own body temperature preventing overheating and chills caused by fluctuating weather conditions. 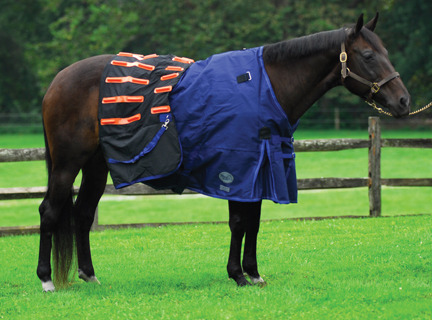 • Can be used during and after competition to keep horse warm or cool. • After your horse is washed, but not dry, its hair can effectively lift, engaging the natural wicking action, which helps prevent chills and skin conditions. • Allows air to circulate over the entire body, resulting in healthier skin. • No more hassles of the time consuming practice of putting on and taking off multiple rugs. • Irregular weather will not affect your horse. On a day that unexpectedly warms up your horse is allowed to sweat freely under the Cool Heat blanket. Body contoured fit, 100% Waterproof /Breathable 1200 Denier Rip Stop Outer Shell with generous shoulder darts and larger tail guard. Features double buckle closures and hook & loop closure at the chest. Massaging flexible insulators throughout.